When we see a good actor at work, we truly believe they ARE that character. But how does an actor properly prepare? How can an actor “land” the role without knowing the show? In this special workshop, join guest artist Molly McGivern, and explore techniques to help you prepare and perform to your best abilities! In this 2-hour workshop, you’ll discover the various techniques to analyze, memorize and actualize. 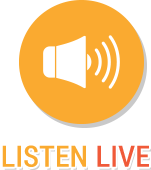 Exercises incorporate focus, imagination, rhythm and improv games, and the how to prepare for cold/short notice readings, different approaches to preparing a monologue as well as presentation of self. Participants will also explore the physical, vocal, and mental techniques of characterization. Learn to say “yes, and…” in making choices, and discuss making those choices as an actor. Actors of all levels are invited to attend! Please bring a water bottle, note pad, pencil, and wear comfortable clothing to move in. Closed-toed shoes are required to participate. 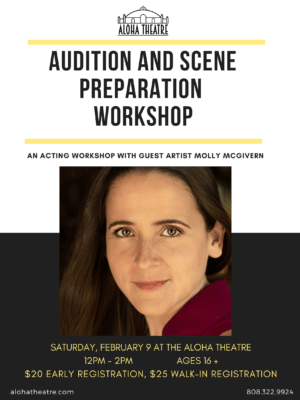 The workshop takes place on Saturday, February 9, 2019 from 12pm-2pm at the Aloha Theatre for ages 16+. Molly likes to keep a foot in the professional word of performance as well as in the underground, avant-garde worlds of indie film and immersive theatre. Molly studied psychology, literature and theatre at McGill University in Montreal. As an actor, she trained at the American Conservatory Theatre in San Francisco, the Academy of Film and Television in Honolulu and Michael Howard Studios in New York while her training started at 4 years old with Judy Berlin’s Kids on Camera in San Francisco. Molly writes screenplays and has written award-winning staged productions, most recently two interactive children’s plays at The Centaur Theatre in Montreal and a short film which won “Best Film” and “Most Creative” at the Montreal Fringe Film Festival. She teaches theatre and directs plays and musical productions internationally. She’s also taught academics and mainstream social skills-building with Autistic children in Hawaii’s public schools using theatrical games and music. She has also used theatre and music as experimentation grounds for teenagers in Mongolia, accompanied dramatherapist Dr. Sue Jennings in working with Roma communities of Romania and has collaborated with “Theatre of the Oppressed” founder, Augusto Boal at the Brecht Forum, NYU. Her work has ranged from a recurring role as “Rosie” on ABC’s “Lost” to indie films, an off-Broadway Revival of Let My People Come, immersive theatre productions in Montreal and San Francisco as well as leading roles at the Aloha Theatre as Eva Peron in “Evita,” Maria in “The Sound of Music,” Janet in “Rocky Horror Show,” and Shelby in “Steel Magnolias.” She is excited to share what she’s learned over the course of her life as both a professional and “starving” actor, musician and writer.